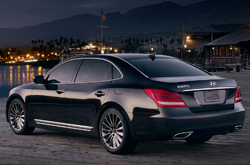 The Hyundai Equus is one of the best luxury cars on the market today. Sporting a gorgeous interior, a bevy of high-end tech amenities and a refined driving feel, the Hyundai Equus offers the same luxury as its competitors, all at amazingly affordable price. 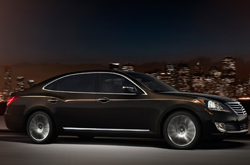 Coming in two trim levels: Signature and Ultimate, the 2015 Hyundai Equus offers Carrollton drivers myriad choices when considering their next luxury car. The base Signature trim comes with several standard features, including 19-inch alloy wheels, automatic and adaptive bi-xenon headlights, daytime running lights, a sunroof, an adjustable air suspension, a rearview camera, keyless ignition/entry and front and rear parking sensors. Upgrade to the Ultimate trim and you'll add a full LCD instrument panel, a head-up windshield display, power rear side window sunshades, power-actuated soft-close doors, a power trunk lid, forward-facing and surround-view cameras and ventilated rear seats. Inside the sedan, shoppers will find a lush and well-appointed interior that offers everything from leather upholstery and driver memory functions to power-reclining rear seats and a heated power tilt-and-telescoping steering wheel. We especially loved the internal infotainment and tech devices on the 2015 Hyundai Equus. Our review found several terrific features, such as Bluetooth connectivity, real-time traffic information, Hyundai's Blue Link telematics system, a 17-speaker Lexicon surround-sound audio system and a dual-screen DVD entertainment system. Under the hood, the 2015 Equus is powered by a 5.0-liter V8 that rates at 429 horsepower and 376 lb.-ft. of torque. This powerful engine is paired beautifully with a standard eight-speed automatic transmission and rear-wheel drive. Speaking of standard features, family sedan shoppers will find that the 2015 Hyundai Equus in Carrollton comes with a host of standard safety features, including stability and traction control, antilock brakes, a driver knee airbag, front and rear side and side curtain airbags, lane-departure warning, blind-spot monitoring and a pre-collision warning system. The 2015 Equus is now available at our showroom, so stop by today for a test drive. Keep reading our 2015 Hyundai Equus review for more details and exclusive pics. Please call 844-868-3133 for further assistance. 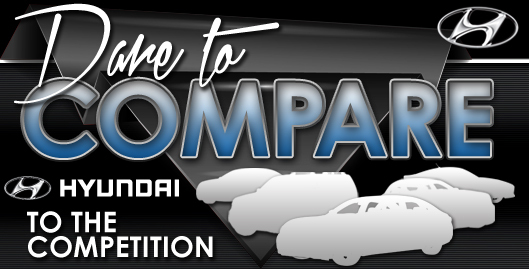 We urge you to compare the most current Equus model against segment competitors like the 2015 Acura RL, Infiniti M Series, Mercedes Benz E Class and the BMW 5 Series. That's how confident we are that it's perfectly designed for you. 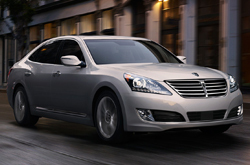 With progressive features and an handsome design, shoppers will love the Equus. Compare its price to the vehicles in its class and you'll see that it's a spectacular value, which is one of the main reasons why so many Dallas drivers select it. Look over our bullets for more info! To make your car search easier, Van Hyundai is happy to offer research tools like the 2015 Equus review above, as well as reviews of prior models. We are a prominent Hyundai retailer in Dallas, and it's our job to serve you with reviews written by some of the most outstanding automotive writers in the industry. Make good decisions when it comes to your next auto purchase - don't take guesses! Each summary is filled with material and vehicle features in a layout that's easy to understand. Is the Equus not right for you? Use our Hyundai reviews and car comparisons to learn about other great vehicles available at Van Hyundai.